This is a great dish to serve at Thanksgiving. 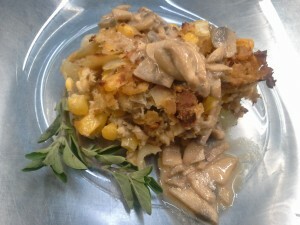 The flavor is reminiscent of stuffing, with the heartiness of a main course. This dish is also very easy to make Gluten-Free. Defrost tempeh if frozen. In a sauté pan bring 2/3 cup water and 2 tablespoons tamari to a boil. Place the tempeh in the pan, lower heat, cover pan and simmer for 10 minutes. Turn the tempeh over and simmer for another 10 minutes. If the liquid evaporates, add a little more water to the pan. Sauté the onion in vegetable oil in a saucepan until softened. Remove from heat. Mash the tempeh into the pan, then add corn kernels, bread crumbs, thyme salt and pepper. Mix well. Turn into an oiled oven dish and bake at 350º ½ hour. Sauté the mushrooms in oil in a small pan until tender. Stir in tahini, tamari and water. Bring to a boil, stirring, then lower heat and simmer for a couple of minutes. Serve the roast with the gravy on top or next to it in a small bowl. * for breadcrumbs, you can use toast a few pieces of bread and finely chop.